Pi Xui (pair): a symbol to ward off evil energy, and to create wealth. 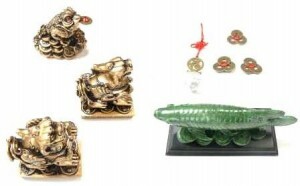 Place a Pi Xiu on each side of the living room window. Dragon Fish: A symbol of prosperity. Place it on your desk or on top of a display unit. It should face the inside of the house. Chinese Lucky Coins: Round shape with a square in the middle, the circle symbolizes heaven and the square symbolizes earth. Carry a set of three coins in your wallet to symbolize prosperity growth. Money Toad: In the Chinese tradition, this is a symbol of wealth. Put near the entrance of your house, facing the door. All these objects are enchanted.